What do every day landmarks within your community and genealogy have in common? Everything! Yes, that is correct, everything. Regional genealogy is all around you. The names of everyday landmarks are useful clues connecting local surnames to specific geographical regions. Some of the oldest family names within a region can be found in the names of streets, buildings, and some of popular destinations within a community. I grew up in the town of Yarmouth, Massachusetts, a small town located on a peninsula known as Cape Cod. Anyone who researches the old New England names will know that there are certain names that are considered “Olde Cape Cod” names. The top names commonly associated with Cape Cod are: Brewster, Alden, Sears, Nickerson, Taylor, and Baker, to name a few. Some of the local landmarks in Yarmouth help tell its genealogical history. Landmarks such as Winslow Gray Road, the John Simpkins School, Baxter’s Grist Mill, Gray’s Beach, and Parker’s River are all named after some of the first families who settled in the town of Yarmouth. The settlement of Mattacheese was first settled during the winter of 1637/38 by Stephan Bachilor; however, it was not a successful venture. Another attempt to create a settlement occurred in August 1638, under Stephen Hopkins, who built the first house in the settlement. In 1639, the Mattacheese settlement was permanently settled by Anthony Thatcher, John Crow, and Thomas Howes. The settlement of Mattacheese was renamed Yarmouth in January 1639. By 1640, close to twenty-five families resided in the settlement known as Yarmouth. I moved to Yarmouth in 1978, from Arlington, Massachusetts. Many of my neighbors and classmates were descendants of those old Yarmouth families, and would treasure how they were connected to Cape Cod and/or Yarmouth. Local history was personal to them; some even lived in family homes that carried the names of their ancestors. It was not until many years later, though, that Yarmouth’s history became personal for me. While researching my maternal grandfather’s lineage in Greene, Maine, I discovered that my great-great-great-grandmother was Malinda Crowell; it took time to learn more about her than her husband’s and children’s names. She was born at Monroe, Waldo County, Maine on 8 July 1834, and was the daughter of Sylvanus Crowell and Clarissa Curtis. My first thought was the name of a street in the town I grew up in. 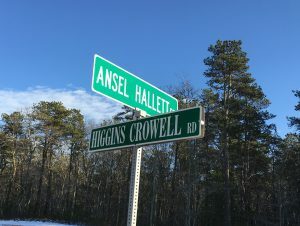 Higgins Crowell Road is one of those roads used almost every day by the average resident of Yarmouth, one of those important “back roads” that residents use to by-pass the traffic on Route 28 in the summer. Higgins and Crowell are two of the oldest names in Yarmouth. When I moved to the Cape in the late 1970s, I never really thought about Higgins Crowell? Why did they name a street after him? The more Maine records I reviewed, the more these old Cape Cod names of everyday landmarks started to jump out at me: names such as Ellis, Hamlin, Parker, Young, and Getchell to name a few. One of the golden rules in genealogy is that there are no coincidences. Why would these Cape Cod names be in Maine? Were these the same families? Could there be a connection? Eventually, the Eureka! moment would come from an old published genealogy, John Crowe and his descendants by Levi Crowell. The work would become the bridge in connecting the Maine Crowell family to the Yarmouth Crowell family. The next step was to prove the information in the genealogy using vital records. Eventually, vital records were located to confirm how Malinda Crowell was connected to the Cape Cod Crowell families. Her father was Sylvanus Crowell who was born 9 July 1802 at Winslow, Kennebec County, Maine. He was the son of Prince Crowell and Abigail Hamlin, and married Clarissa Curtis in Monroe on 1 May 1835. Prince Crowell was born 22 January 1776 at Yarmouth. He was the son of Shubael Crowell and Abigail Parker, and married Abigail Hamlin. Shubael Crowell was born 10 March 1754 at Yarmouth. He married Abigail Parker at Yarmouth on 2 March 1775. They had nine children: Prince, Higgins, Shubael, Sylvanus, Joseph, Ebenezer, Jonathan, Abigail, and Elizabeth. Prince Crowell was Higgins Crowell’s brother. Shubael Crowell was the great-great-great-grandson of John Crow, the same man who was one of the original settlers of Yarmouth. Identifying Malinda Crowell’s ancestor as John Crow of Yarmouth was made possible by an everyday street sign. Higgins Crowell was my great-great-great-great-great-great-uncle, and Malinda Crowell’s great-uncle. Why are everyday landmarks important to genealogical researchers? When you pay attention to the landmarks in the regions you are researching, you learn about the local families and their history. In my case, a road that was used in my everyday life helped me to connect the dots from Greene, Maine, to Yarmouth, Massachusetts. Charles F. Swift, History of Old Yarmouth, Comprising the Present Towns of Yarmouth and Dennis (Yarmouthport, Mass. : The Historical Society of Old Yarmouth, 1975), 21–27. Elizabeth M. Mosher, ed., Vital Records of Monroe, Waldo County, Maine, prior to 1892 (Camden, Me. : Picton Press, 1991), 148. Levi Crowell, John Crowe and his descendants, a genealogy (New York: T. Y. Crowell & Company, 1903), 77. Robert M. Sherman and Ruth Wilder Sherman, comps., Vital Records of Yarmouth, Massachusetts, to the year 1850 (Camden: Picton Press, 1975), 347. Ibid. ; Crowell, John Crowe and his descendants, 77. Mosher, Vital Records of Monroe, Waldo County, Maine, 75. Sherman and Sherman, Vital Records of Yarmouth, Massachusetts, 268. Crowell, John Crowe and his descendants, 77. Sherman and Sherman, Vital Records of Yarmouth, Massachusetts, 113. Crowell, John Crowe and his descendants, 50. Sherman and Sherman, Vital Records of Yarmouth, Massachusetts, 268; Crowell, John Crowe and his descendants, 50. Swift, History of Old Yarmouth, 21–27. So true! When I go visit New England again, I’m going to be on the lookout because I have numerous ancestors from every New England state except Vermont and many of them made their mark. Where I live there are also street names and building names that are associated with historical figures in my city. But there is a new trend toward renaming some streets or places for people who had absolutely no connection to the location – or who had never even been in the place (and maybe never heard of it!). I don’t understand that. There’s a particular *mystery* branch of the Beebe family who migrated to Quebec around 1800, then back to the U.S. The family’s been here since 1650 but as far as I can tell, they weren’t prominent people. (Mostly they were just EARLY to migrate.) Yet everyplace I’ve found them, there are streets, rivers, lakes, and parks that carry their name. There’s even a whole region, Beebe Plain, that straddles the U.S.-Canadian border at Derby, Vermont. I live in a different state than where these people settled but I’ve even run across Beebe lakes, parks, and roads in my metro area. They’re everywhere! For family and street names, there are Fabyan Way in Buzzard’s Bay MA and Fabyan Parkway in Geneva IL. And I agree with Janice completely about renaming of streets; if one wants to change 1st Street, fine but not a street named for a person involved in the history of the area. Recently a local area was renamed back [Yea] to its original name, a pioneer in the area. whose land they passed through, name it and he named it after his wife. So while we can look up old names of streets that have changed we can also expect to find grandma and grandpa commemorated in place names too! Is that Hallett related to William Hallett of Astoria, Queens? I am a descendant of the Higgins families that lived in Barnstable, Eastham, and Cummaquid, (and perhaps Yarmouth, since I am a descendant of Stephen Hopkins, as well.) They moved to Mount Desert Island. Maine in the 1670s. I have not found a link to the Crowell family, but the boys named Prince and Higgins that you mention could be the surnames of the husbands of either the mother’s or father’s siblings. That was very common. Will keep looking. Martha, Higgins is a maiden name for one of the wives. In addition, the lineage of the Crowell/Higgins line leads to Thomas and Joseph Rogers who were passengers on the Mayflower. Thanks, Kathleen. I am also related to Thomas Rogers through my mother’s family line, Googins, as well as through my father’s line, Higgins. I guess if one’s family goes back that far, it’s no surprise that there were so many convergent lines. I would love to see how the Higgins line relates through the Crowell line. My e-mail is a t l m a i n i a c @comcast.net, with no spaces in atlmainiac if you’d be able to send me that information. Thank, again. My niece’s mother is a Luce. Tracing the Luce family tree, we found they have lived in Maine for a long time but before then came from Martha’s Vineyard off Cape Cod. Since Maine was part of Massachusetts until 1820, this was just a move from one part of the state to another. Your article is very interesting. I have the John Crowe And His Descendants” A Genealogy (1903) you mentioned. I see there are several other books maybe I should I invest in. Malinda Crowell is my husband’s 2nd great grandmother. I am going to try and find all the documents I can for his tree and the lineage back to the Mayflower. Kathleen, Your Yarmouth, MA connection immediately caught my eye as I am trying to trace a connection from my Nathaniel Parker great…grandfather of mid-18th century Cape Elizabeth, Maine back to his early family origins (hopefully) in Yarmouth, MA…it’s a bit of a brick wall, and I have in fact hired NEHGS researchers to help me. I am hopeful that the “Parker River” in Yarmouth may be named after this early ancestor. The quest continues! Certainly there are many Maine families that can trace their origins back to Plymouth Colony and Mass Bay. My Mayflower ancestors all became Mainers after a few generations. The Parker family is an old Cape Cod and Yarmouth family name. Wish you well in your research. We might have some common ancestors. Enjoyed reading your article on Yarmouth and street signs. Since my maiden name is Eldridge, I was surprised none were mentioned. I believe one of my ancestors, born in Yarmouth, was a founding member of Chatham. Very interesting … I’ve been wondering just how many coincidences I can overlook before I say it can’t be a coincidence anymore. I also have been checking out Crowell lines/trees. Wondering if a probable multi great grandmother of mine who married a British soldier ‘Crow’ might herself have been a ‘Crowell’ … their grandchildren made a surname change from Crow to Crowe to Crowell. Sound familiar? Three avenues of searching have each led me to the same family. Are you at all familiar with the Crowells who settled in New Jersey? 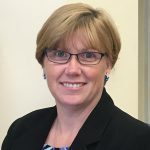 Hi Kathleen- So happy to see this informative article you wrote. Your Melinda Crowell is the sister to my Great great grandmother Abigail Ellen Crowell! I have photos of Abigail if you’d like me to share them with you. I am in the final stages of proving our lineage back to Thomas Rogers of the Mayflower through this Crowell line. I was wondering if you have you ever found a death date &/or place for Sylvanus Crowell? I have not been able to find that. My grandmother, Avis Littlefield Creese, said that he died relatively young, but didn’t know more than that. The Arizona Historian for the Mayflower Society says the line has already been proven from Shubael Crowell back to Thomas Rogers, so I just need to prove my lineage to Shubael. You probably already know this. It is so nice to learn of a cousin who is a professional genealogist!